Impulse Against Your Trade: Should You Hold or Scratch? I wanted to ask what do you do in a situation where price retraces just enough to scare you. I mean let’s suppose we just trade with one contract to make things more interesting. We consider setups that offer a 2:1 as R:R. You enter your position (with one contract) and price goes in your direction but bang it reverses and goes so far as coming back to the level of your entry point. What tricks if any would you recommend to avoid scratching the trade? These situations offer quite a challenging dilemma to me. Any advise is welcome. I have included a setup which occurred during the Globex session on the ES today March 14, 2012 (Eastern Time zone). I did not trade it but it illustrates quite well such a situation. Denise Shull (http://therethinkgroup.net/) raised an interesting point in a recent webinar … that trade results will almost always lead to regret, regardless of whether they’re a winner or loser. A losing trade is obvious, leading to all the questions in our mind such as "why did I take that entry?" or "why didn’t I scratch as soon as I saw ***?". A winning trade is not so obvious though. But if you think about it you’ll see that there is almost always some way that we could have improved upon our results. Usually this will result in either regret for having exited too late after the market reverses and takes away much of our profits. Or regret for having locked in our profits too quickly and then missed out on much more as the market moves on without us. Your example trade definitely fits into the latter category; resulting in frustration and regret at having missed out on any profits at all despite having correctly identified the move. It’s important therefore to first recognise that you will never perfect your exit strategy. Review the "exit strategy" ebook at http://yourtradingcoach.com/ebooks/, in particular the part discussing the fact that you can never know the optimal exit strategy for any trade until after it’s over. You need to learn to accept imperfection and to forgive yourself for less than optimal decision making. That being said, we should always strive to learn and to improve our decision making. Let’s discuss first the decision to move the stop (or scratch a trade). Then consider some ways we may be able to improve our decision making. A stop should only be moved when we identify a new level that will invalidate the trade premise if hit. In addition, we may work an exit or scratch a trade if either (a) the trade has not acted as it should within an expected period of time (time stop) or (b) price acts in a way to lead us to doubt our decision. Assuming I understand correctly, you’re talking about scenario (b); price retraces via a big red candle to scare us out of the trade. Obviously a multiple part position will help as it gives you the option of scaling out rather than exiting all-out. Scale out one part then reassess. Wait to see what occurs from that point. If the exit was premature then you’ll still have a partial position on to take all the way to the targets. So consider whether or not there is any way at all to allow a multiple part scale out strategy. If not that’s fine. But if it can be achieved through reducing trading timeframe, or whatever other means, then give it a try. Upon exiting a trade, get in the habit of ALWAYS questioning whether there is a re-entry opportunity. In this case a lower timeframe may have shown evidence of the bearish move stalling, allowing a breakout of this lower timeframe stall pattern to re-enter in the original direction. (I haven’t checked the charts… this is just an example). But get in the habit; for those trades you scratch and also for those stopped out. Analyse stats for a sample of trades (20 min, ideally 100 or so). Note whether the trades you scratch end up going on to the target or the stop. Compare the results you achieved through active management with those you would have got through passive management. It may well be possible that you’re better off just setting your trades and walking away, allowing them to hit one or the other. Ask yourself whether or not the fear you suddenly feel is justified. I realise that your chart is just one example. And yes it is a big red candle. But it is a range candle (see YTC PAT section 3.5). It not only failed to close below the low of the prior candle, but it in fact failed to trade at all below that prior low. It may be red and have closed near its low, but it’s not really as bearish as it looks. Consider CONTEXT! Further to (4) above. If big red bars or big green bars are leading to over-reaction (emotional lows or highs respectively) then consider changing the colour of your bars to something more neutral. Maybe even just to the older, more traditional, black and white candles. Or even better, to OHLC bars. Serious… colour does provide some emotional input into our decision making. Particularly lots of red which is always used as a sign of warning. 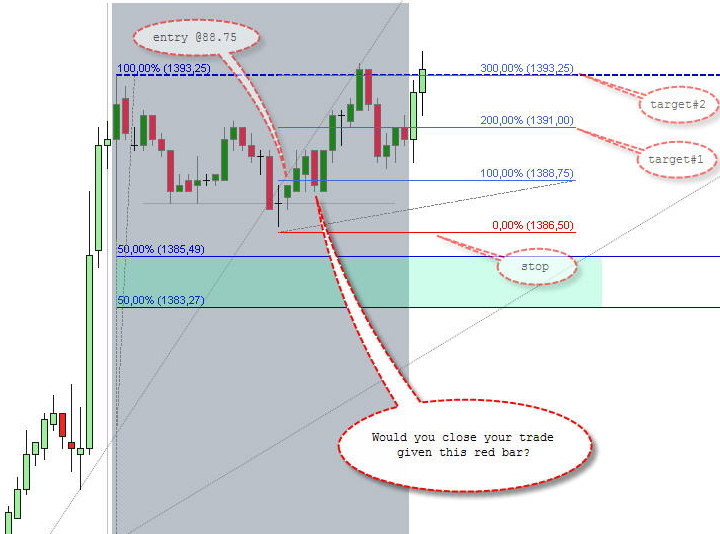 Consider the following on trade entry… ALWAYS expect a retest of the entry point. If you plan for this and it doesn’t happen, that’s great. But by expecting it, then you won’t as easily get shaken out during the first test of this level. Retests are common… for much the same orderflow reasons as why a breakout often returns to test the breakout point, just on a lower time scale. Doing this will mean that sometimes, when exiting was the right decision, then we’ll end up taking a slightly larger loss. Other times though, we’ll be able to hold through this first initial test without flinching. Analyse the source of your fear of loss. Fear can be a massive input into your decision making processes. And rarely is it a good input. When you feel this sudden fear, and an associated urge to scratch a trade, consider the nature of this fear. Write down what you’re thinking and feeling. Over a sample of 20+ occurrences, start to look for some common patterns. There is great value in examining our emotions and feelings. Consider never scratching immediately, but rather working an exit, in particular in cases such as discussed in (4) above when the bar had not broken any prior lows. Working an exit will involve tightening either the stop or target (or both) in accordance with any lower timeframe swing highs/lows or areas of congestion. So for example in this case we may have just tightened the stop to two ticks below the low of the 3-bar range that we now have. This would not have been stopped out. Granted, we risk losing a little more if the bearish move continues. But we also leave open the potential for profits if the move is just a retest rather than a reversal. a. How will I feel if I scratch the trade and then it moves on to the target without me? b. How will I feel if I don’t scratch the trade and I end up taking a full loss? Which feels the worst? That will tell you which to do. If the lost profits in scenario (a) are the worst, then don’t exit. Risk a full loss. If the full loss will feel worse, then exit. Even if you’re subsequently proven to have made a wrong decision, you can be happy that you at least managed risk to protect yourself from the absolute worst-case scenario. Oh… by the way… very nice trade setup! Well spotted.